That looks like a fantastic trip. We are considering a driving trip with our boys. Three boys plus long driving trip equals frustrated parents. 🙂 When I was growing up, we used to take two week driving trips during the summer. I loved it. We visited places like Grand Canyon, Red Wood Forest, Hearst Castle, Vegas, San Diego Zoo, etc…I think my favorite was Grand Canyon. Great pics! One of my friends and I used to go on day-trips, anywhere within a few hours of where we lived, and we always had a blast. I think day trips are fantastic, Jennifer… Tons of fun, and not much work! Looks like a fun trip! You’ll have to share pictures of your new place once you’re settled in. Are you planning to review THIS IS NOT A TEST? I’m debating putting it on my TBR list, but zombies sort of freak me out. I’ll definitely end up review it, especially if it holds up to its fantastic first half. I don’t love zombies either, but it doesn’t really matter because this book is much more about people and their messy lives. It’s just set against the zombie backdrop, which so far has served to escalate the tension. What a fun trip!!! I’m thinking about taking a road trip to Monterey with the princess this summer…your pics are making me really consider it! Your daughter’s outfit is adorable!! I am inclined to believe that Grandmother Willow was far too independent for Grandfather Redwood so after a brief affair, they parted as friends. 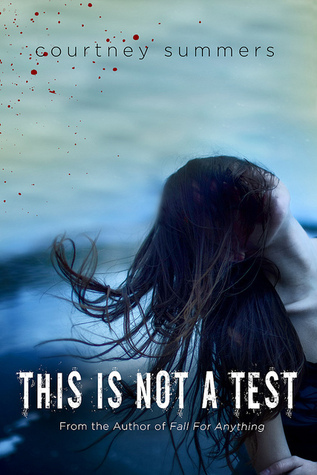 This is Not a Test is not the type of book I would normally read, but I definitely want to read it. Sloane intrigues me. Also, I’ll read anything by Courtney Summers. Love all the pictures! Looks so beautiful. You are really making me want to hit the west coast! The one of your daughter with the sea star is so cute. Thanks, Zanne! She was a little hesitant about touching the sea star at first. 🙂 And yes, I’m a big Courtney Summers fan as well. So far, THIS IS NOT A TEST is not really about zombies. It’s about people and their unflinching realities, just like the rest of Courtney’s books. I can’t wait to see how it plays out. We did this route two years ago, but my daughter was too little to really appreciate it. This time around was much more fun! And yay for Tillamook! We most definitely indulged in their ice cream — yum! Beautiful pictures! I love the redwoods. Moves are exhausting, but it looks like you’ve had amazing scenery on the trip. Your new hometown is around Monterey? You lucky thing you! I live in Sacramento, but I would kill to live closer to the coast. 😉 Those are some gorgeous pictures. I hope you all get settled and comfy soon! I can’t WAIT to read THIS IS NOT A TEST. THIS IS NOT A TEST is really cool so far, Kelley. I have a feeling it will be very well-received when it releases. And yes, we’ve only spent a day in Monterey, but we’re already loving it! Ooo. You live close-ish to me. I’d love to meet you for lunch sometime and talk writing. I’m Emily and crit partners with the lovely and brilliant Taryn, who I believe you’ve met. Thanks, Emily! We’re happy to be California residents, at least for the next couple of years. 🙂 And I’d LOVE to meet up. I was just thinking about how I need to weasel my way into the YA (or just writing!) community around here. We’ll have to exchange info soon! I’m so excited you’ll only be a few hours away! It has been WAY too long. Can’t wait to see you! Yay! We’ll definitely have to arrange a meet-up, Kristen! Your road trip looks wicked! Also I am so jealous you got to go to Redwood Forest – I have ALWAYS wanted to go! Great photos! Looks like an awesome time. Thanks, Dana! It really was fantastic! I loved this post. I started that song and listened to it while looking at your photos and I felt like I was watching a slideshow of your trip to CA. It looks like you had such a great time—way to make the most of a move! I love the photo in front of Haystack Rock. Gorgeous! So glad you arrived safe and sound in CA! And looks like you had a blast too! As far as my favorite road trip – I’ve had a lot of wonderful ones with the family, but I’m not going to lie – most memorable was spring break senior year. Traveled the eastern seaboard from PA to Charleston and back and well…it was an adventure. Ha! An adventure… Something tells me that’s putting it mildly, Alison. 🙂 I’m sure you made many, many amazing memories! I’ve LOVED seeing your Instagram photos! You have such a beautiful family. 🙂 Glad you’re in your new hometown and getting settled. Hope you get to start writing again soon!